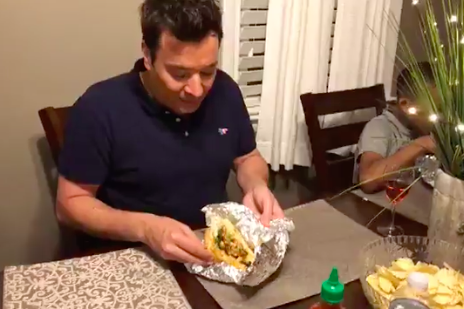 Jimmy Fallon eats a salmon cheesesteak at the Northeast Philadelphia home of Rodney and Khadijah Moore. If you were among the Philadelphia families who applied for the honor of hosting Jimmy Fallon and Tariq Trotter for a #SurpriseDinnerParty, sorry, you did not get picked. But for Rodney Moore and his family in Northeast Philadelphia, Tuesday night marked a special visit from "The Tonight Show" host and The Roots emcee. The full visit and dinner in Philadelphia were streamed via Facebook Live on Tuesday night, part of a recurring series that takes NBC's late night personality to various towns to dine with local residents. Rodney Moore, a recently converted pescatarian, eschewed meat in favor of a salmon cheesesteak recipe. His celebrity guests relished that creative twist as they sat around the dinner table. Granted, Black Thought said he's got an affinity for Dalessandro's, but Moore's homestyle cheesesteaks apparently hit the spot. Two bowls of Ruffles chips didn't hurt, either. Check out last night's livestream below, which also features Fallon schooling Moore's son, Miles, in "NBA Jam" (with the Knicks, of all teams) and a group sing-along after the meal. Some unadventurous PhillyVoice colleagues (everyone except me) cringed at the idea of fish and cheese going together. They don't know what they're talking about. Invite me over, Rodney. Invite Questlove, too.